At the age of 2, Graham was diagnosed with Ollier’s Disease. Only 1 out of 100,000 are diagnosed with this rare disease. Currently, it is affecting Graham’s growth plate where his femur and knee meet causing him to have a short left leg. At the age of 5, he had surgery in Atlanta, Georgia to rotate and straighten his leg. At the age of 8, his leg length discrepancy was 12 cm and and doctors were recommending amputation. Most doctors where we live did not have any knowledge of Ollier’s Disease. After a couple of months of searching, we found the Paley Institute and came to Florida for a consultation. We were met by both Dr. Paley and Dr. Robbins who gave us hope that they could help Graham get both feet on the ground. It was such a relief to hear about other patients that they have treated and are treating with the same disease. It was comforting to know that we weren’t alone. Graham had his first lengthening and knee reconstruction the summer of 2015. With knee reconstruction, Dr. Paley and Robbins were able to again 2.5 cm in Graham’s leg and was able to get another 5 cm by lengthening with the Precice. During the summer of 2017, we returned for Graham’s second lengthening. Dr. Robbins swapped his 5 cm Precice for a new one and gained another 8 cm. Graham’s feet were closer to the ground than ever before. We are so thankful to have found the Paley Institute. The whole Paley Team has been amazing to work with. They all truly care for their patients and are like family. We are thankful to be able to connect with other patients and their families, even a few with Graham’s same disease. It’s such a blessing to be able to support each other as our children are going through lengthening. 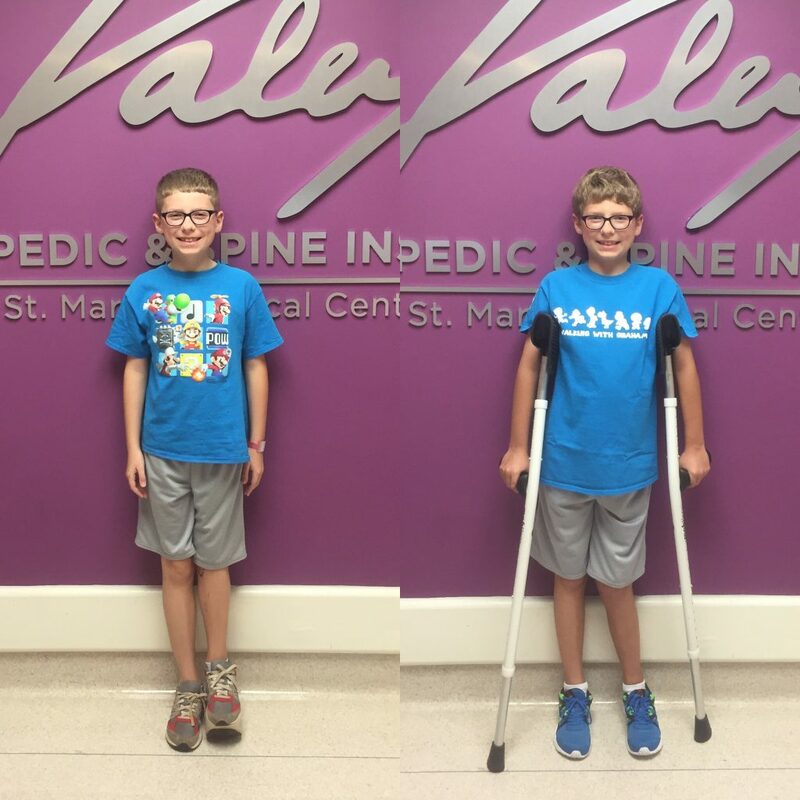 Graham’s lengthening journey is not over and we will be back for future lengthening, but we are forever grateful for Dr. Paley and Dr. Robbins for saving Graham’s leg, making him a new knee, and giving him the ability to walk, run, jump, and play.